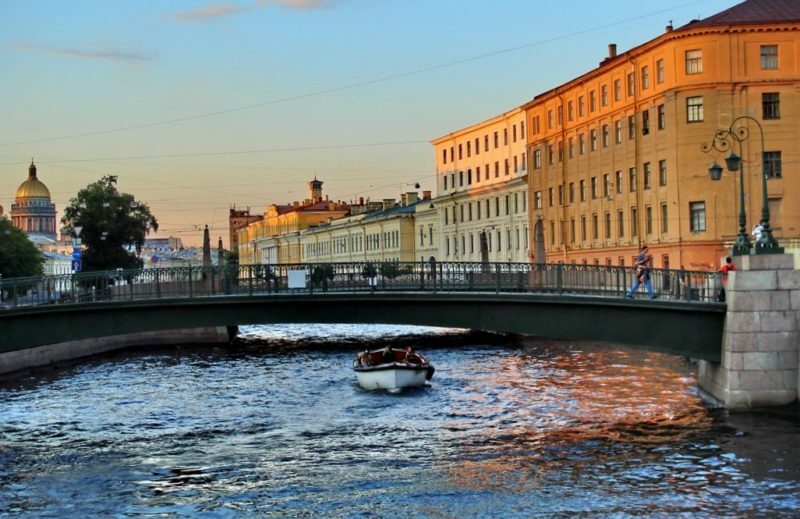 If you have some devout wishes - explore these «fortunate» places of St. Petersburg. The main thing is strictly following the instructions! 1. The Alexander Column- Palace Square. The place of power at Palace Square is the Alexander Column or as it is called too - Alexandria Column. To make a wish come true you should go round a column clockwise thrice, visualizing the desirable. If you'll do your best to believe in it, your desire will come true. 2. The Persians- Millionnaya Street, 35. The portico of the New Hermitage (from the side of Millionnaya Street) is decorated by the figures of powerful Persians. People address to the Persians in a wedding day- they present happy married life. All it takes is put your faith in it and touch a big toe of the Persian, the second from the Field of Mars to Persian. To make away with personal problems, it is necessary to do the same kind of thing, but there should be nobody next to you. 3. Chapel of St. Xenia of St. Petersburg- Smolensky Cemetery, Kamskaya Street, 24. The patroness of St. Petersburg grants romantic wishes. For this purpose it is necessary to write down your wish on a sheet of paper and put it under a box with candles. Preliminary it is necessary to go round the chapel 3 times. 4. Semimostye - Pikalov Bridge through Griboyedov Canal is located along Kryukov Canal, between households’ No. 19 and 21. If you want your wish comes true, you should view each bridge by turn, and make a wish after it. Those who tried to do this thing, unanimously maintain that the wish will surely come true. The wish has the greatest probability of implementation in case you make a wish on the 7-th of July at seven o'clock. 5. Siskin-Piskin- Nab. Reki Fontanki, 2. There is a Monument to Siskin-piskin and children's song located on the Nab. Reki Fontanki near the Panteleymonovsky Bridge! This miniature (by the way, the smallest urban sculpture) possesses an amazing force, bringing a great piece of luck to people. To make your wish being granted, threw the coin in a proper manner - it must lie on the monument's pedestal or knock the bird's beak. Sometimes the monument is perished but they return it into its place. 6. «Drevo zhelanyi» - Kronstadt, Karl Marx Street, 13. The big cast-iron tree with a big ear will hear any wish of arrived people. To make your wish come true it is necessary to throw a piece of paper with the written wish in the owl's nest, to rub the fawn's nose and tail or just whisper your wish to the tree. 7. Hole Monument - Mayakovsky Street, 3. But now it is difficult to call it creative work. They say that a new city tradition has appeared - to push hands in a hole, it helps to find the helpmate. To find your other half, it is enough to push a hand in a hole and think about your wish. 8. Janitor - Ostrovsky Square. This monument is created for those who want "shovel in money". You should leave a coin at the janitor's shovel at Ostrovsky Square. 9. Statue of Lamplighter- Odesskaya Street, 1. Rub the worker's bronze boots to let the wealth and wellbeing visit your house. The tired lamplighter dropped a curtsey on the enclosure now will have a rest and then gain a strength to grant your wish. 10. The monument to the dog named Gavrusha, Pravdy Street, 11 (in the yard). The dog will grant your wish with a great pleasure. It is enough to write the letter and to put it in a mailbox or to whisper your wish to the canine friend’s ear. If you put your hand on the head of these mystical beings or put a hand to their chaps, your wish will be granted. For the sake of good order, come to gryphons at night. 12. Sphere-fountain and the Photographer monument, Malaya Sadovaya St., 3. There is a ball-shaped fountain of accomplishment of desires at the beginning of pedestrian zone on Malaya Sadovaya Street . For accomplishment of your wish it is necessary to propel a ball. On the same pedestrian zone there is one more unusual monument - the monument to photographer with bulldog. This monument brings happiness, for this purpose it is necessary to make a wish and to be photographed against the background of a wonderful dog. To have enough money in your wallet, hold the little finger of a bronze photographer. To make your life joyful and happy — take the photographer by an elbow. Also do not forget to pat a bulldog! 13. The monument of "Kot Yelisey" and "Koshka Vasilisa"
There are symbols of cats that saved the city from rats during blockade in the same place on the eaves on Malaya Sadovaya Street. Today the tailed help Petersburgers to call luck. For this purpose it is necessary to throw a coin so that it remained lying near the sculptures. It is considered that happiness will not abandon lovers who kiss on this bridge, and more likely- under the bridge. The second variant is possible if you buy tickets for boat excursion down the Moika River. If you leave the significant other on Potseluev Bridge, the new meeting will occur undoubtedly. 15. Ostap Bender - Italyanskaya Street, 2. On the street near the restaurant there is an amazing Ostap. They say that he grants wishes especially adventurous ones. To make the wish be granted it is necessary to rub the Ostap's a nose tip. 16. Peter I the Great - Peter-Paul Fortress. Shemyakin's monument to the Founding Fathers of St. Petersburg can endow with wealths those one who will give a rub to his right hand or knee. If you hold his left hand — there will be the time of love soon. 17. The monument to the hare on piles - Ioanovskyi bridge near the Peter-Paul Fortress. The hare sitting on a pile will surely grant your wish if you throw a coin so that it will remain on a pedestal. 18. The fountain in the Garden near the Admiralteystvo. If you stand so that the building will be in front of you, and the fountain behind you, you can make a wish and throw the coin over the head. Then just go further without wangling! 19. The monument "Begemoticha Tonya"- Universitetskaya quay, 11. The river-horse's heo lives in the yard of Saint Petersburg State University's faculty of philology together with other nice sculptures. If you want to wed rub the right ear of the monument and if you want to lead to the altar - rub the left ear. Visit SPb Tram Museum and have a memorable ride on a vintage tram through the historical attractions. If you are looking for something unique to do in Saint Petersburg, experience Russian Blacksmith mastership! Book your tour with us and get a free visit to the Faberge Museum!